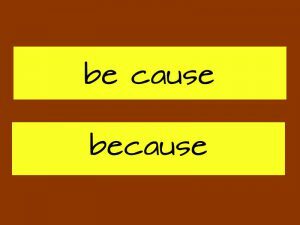 Here's the second part of thinking about making up sentences as a way of remembering how to spell words. 'Big elephants can always understand small elephants' is by far the most popular one I've heard at all levels. What's the alternative and why is it better? When you've got a word that many of your students find tricky, 'building with puzzle pieces' is a superb solution because it's a failsafe way into spelling, and that makes everyone happy! For the purpose of this lesson, I'm assuming the students are young and they don't know much about building with puzzle pieces. Second - Get everyone to say the word clearly and count syllables. We only tap on the table lightly, putting out a finger for each syllable. Anything else is distracting and/or embarrassing for older students. Teacher voice in red & Pupil voice in blue. 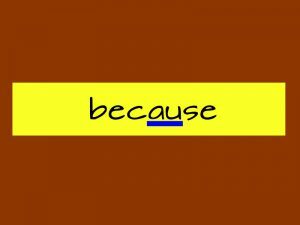 How many syllables in 'because'? 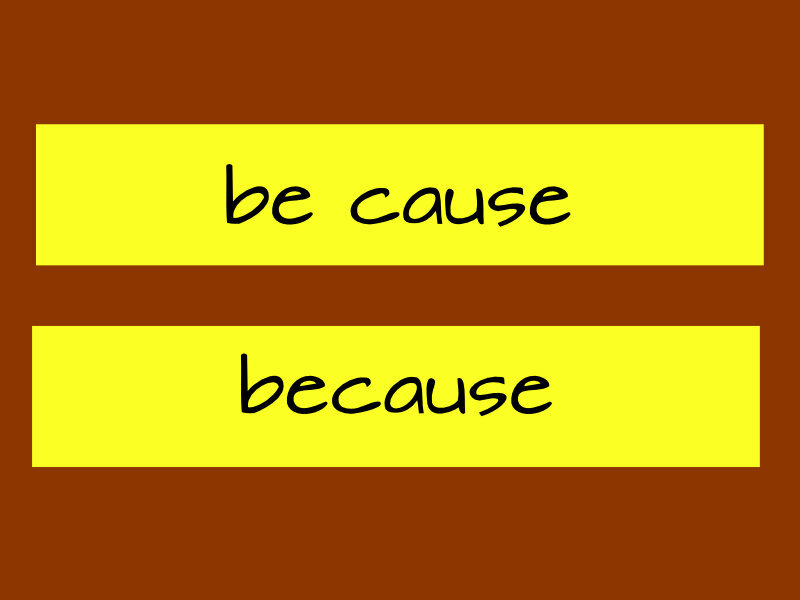 We're going to make this easier to spell by saying bee cauz. The TST community is global and that <au> in 'cause' has a variety of pronunciations, so go with the standard accent of your students. It's imperative that every child says the whole word out loud. This won't work if they're only listening. What's the first syllable again? What's the first sound in be? Can you see which puzzle piece we need to move? They point at the <b>. You move the <b>, saying the sound, and they write b on their spelling worksheet while saying the sound. More able and older students will say and build whole syllables. I'm assuming these students need to be working sound by sound. What's the next sound in be? 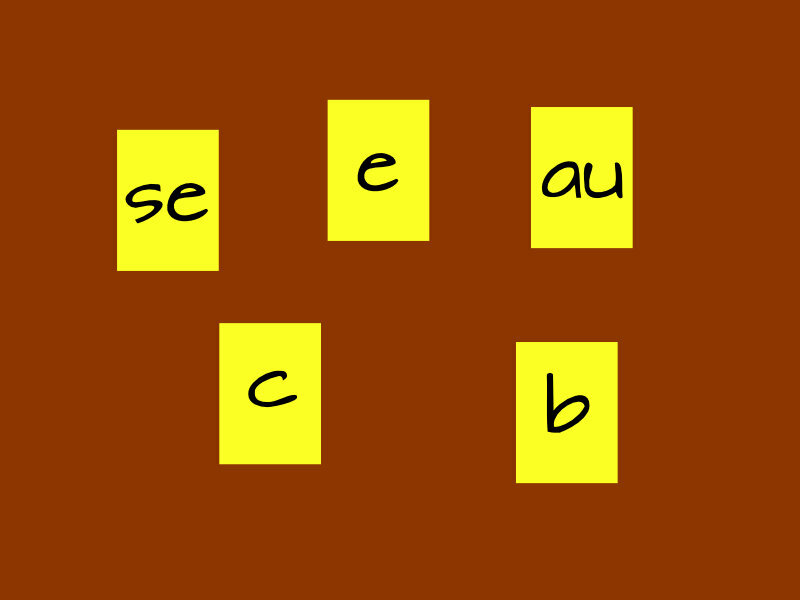 This will ensure they know the syllable 'be' has 2 sounds: /b/+/ee/. That's most important for those students who might want to spell a syllable with a letter name. 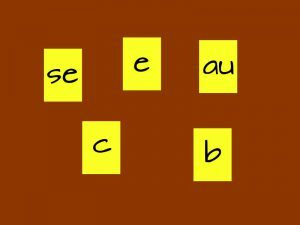 Move the next piece, saying 'ee' while students write, saying 'ee'. Repeat with each sound, remembering that /au/ and /z/ are spelt with two letters each. Say the one sound while writing both the letters. If anyone is saying, "a" "u" and "suh" "e", that's what I call 'toxic phonics'. They should be saying "au" and "z" continuously while they're writing. Then everyone can copy this saying the sounds as they write, syllable by syllable then all one word. Finally, get everyone to decide what their tricky bit is. Which bit are they going to have to concentrate on remembering? It's probably going to be the <au> and might be the <se>. Get them to underline their tricky bit or bits. The last step is to think of a familiar word which will be the header for a bundle. If their tricky bit is the <au>, then my Canadian accent says bundle it with 'August' and 'haunt'. If your accent is different, you might bundle it with 'sausage' and 'Australia'. (Thanks to Spelfabet for those ones.) Suggest other ones that work better with your accent. 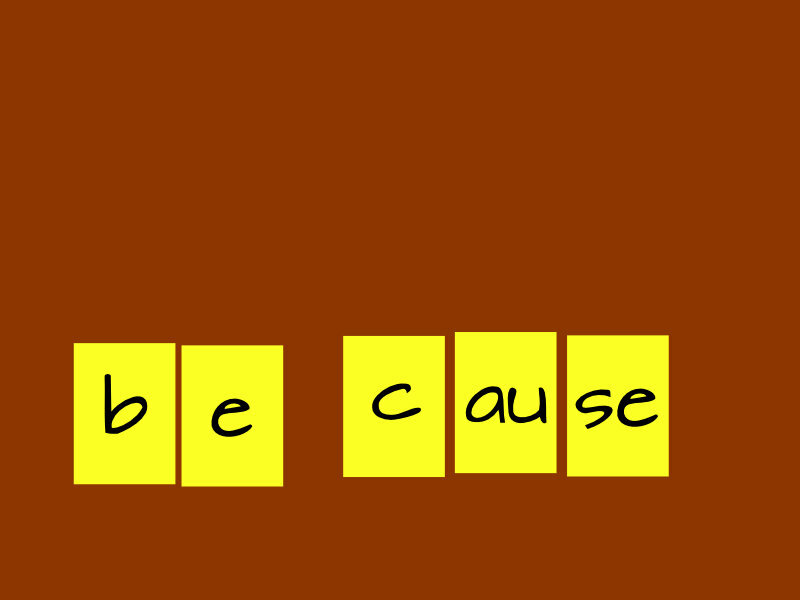 If the <se> is also a tricky bit, then bundle it with 'cheese' and 'please'. 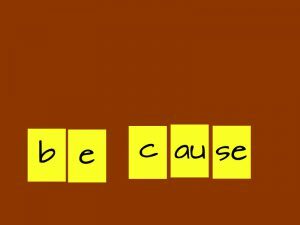 Now, when your students are writing 'because', they'll have a self-talk script to get them through. How do you spell the 'z' sound in because? 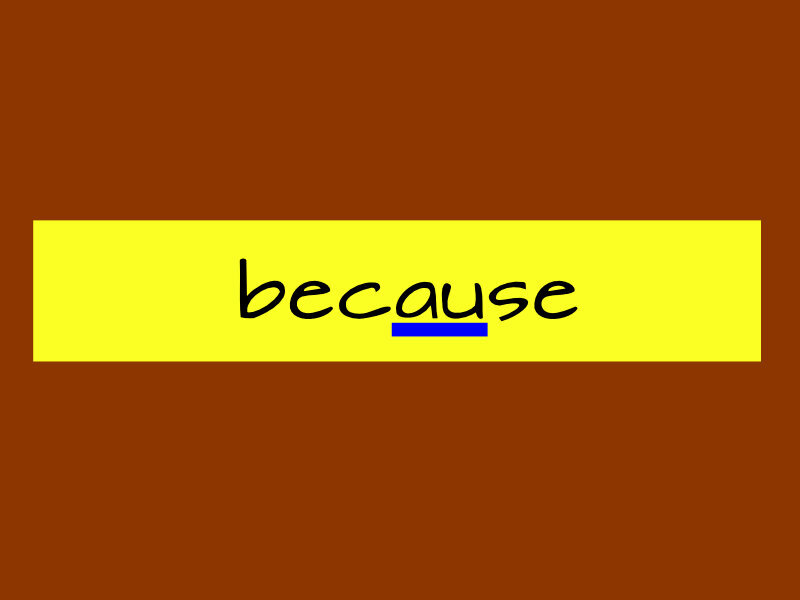 They're on their way to being able to spell 'because' but they've also gained a way of talking about all spelling. That Spelling Thing students don't say, "How do you spell ....? of "I can't spell....." Instead, they work through the process and narrow the word down to the bit they don't know, then ask about that. They use precious memory only for the bits that don't come automatically. The more they practise, the more comes automatically. Both methods are fun and don't require specialist knowledge, but making up a sentence like the elephant story has major flaws. It focuses on the visual representation of the work without connecting it to speech or meaning. 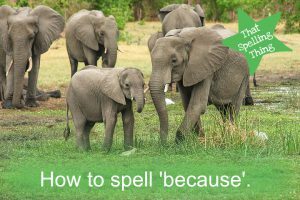 It doesn't point students to the logic of English spelling but rather re-enforces the myth that English spelling is chaotic. It doesn't differentiate between what a student recalls easily and what they need to work on remembering. It improves a student's speaking and listening as well as their spelling by starting with clear pronunciation. Instead of focusing on one word, it expands vocabulary and causes students to see patterns and tendencies in the language. It gives everyone in the classroom - teacher and students - a common vocabulary for talking about spelling. It's cumulative and collaborative. Everyone can participate and add information as they find it. It still requires memory but quickly shows each individual where they need to concentrate. It works for any person beyond the emergent spelling stage. Feedback is that teachers and tutors with their own spelling insecurities are improving their spelling while using TST confidently. If you'd like to see what a more grown-up building lesson sounds like, grab a pen and paper and watch this short video that accompanies the TST manual.